The First Lady Meets Natasha Devon for some Body Gossip! What is body gossip and why did you become involved? Body Gossip is a campaign which promotes healthy and realistic beauty. We invite everyone in the UK to write something about their unique, real body and submit it to our website. We receive stories about adolescence, aging, pregnancy, sports, illness, injury, disability, eating disorders, to name a few. Some are poems, others pieces of dialogue, others straightforward prose. Some are hilarious, others reduce us to tears. We select some to be performed by our celebrity cast, either in live events or in one of our short films, and others to be featured in our Body Gossip book, which is due to be published next year. 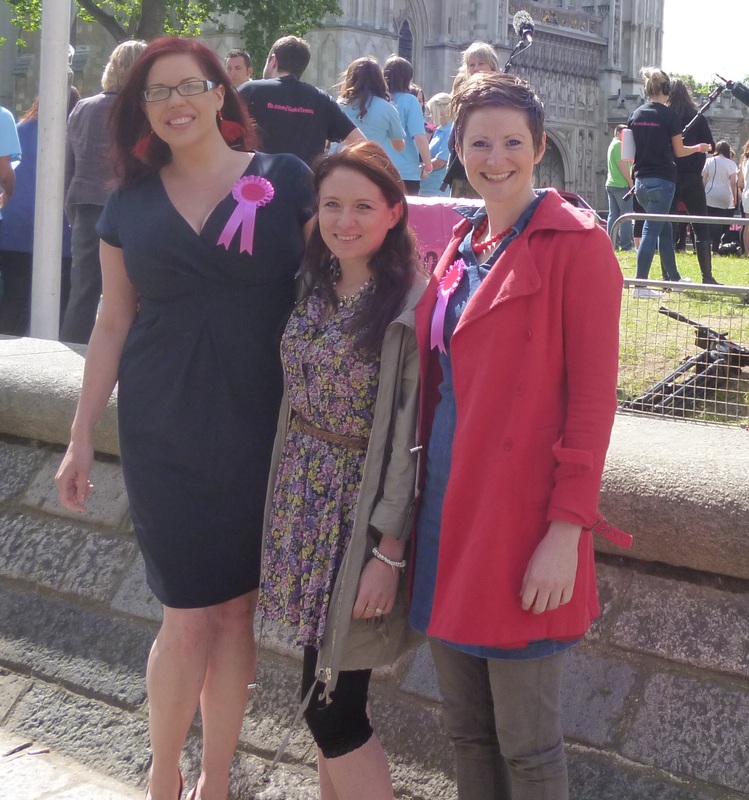 The idea is that we are empowering real people and giving them a voice to shout about all things body image related. 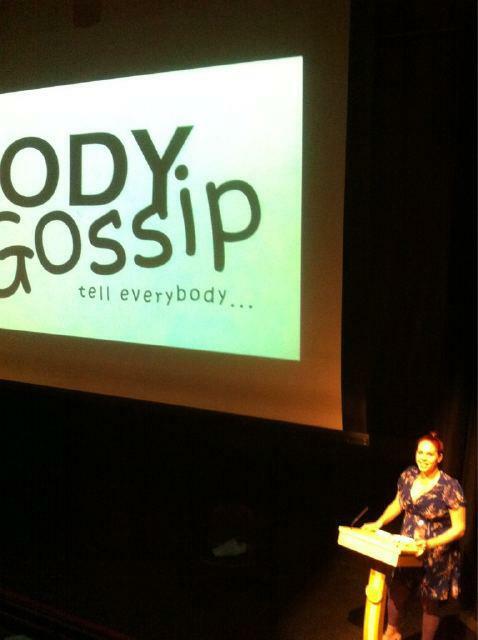 Body Gossip also includes an education program, Gossip School, which I run. It’s a 1 hour self-esteem class aimed primarily at 14-18 year olds (although we do also work occasionally with universities) and so far we have worked with about 3.5 thousand teenagers from all over the UK, helping them with issues like low confidence, bullying, self-harm and eating disorders. Body Gossip was founded in 2006 Ruth Rogers, who is my friend from school. In fact, she was Head Girl and I was her Deputy! She got in touch with me in 2008 and told me about the work she was doing, which at the time focused on turning Body Gossip stories into live theatre events. I was trailing my self-esteem class in a school in Essex at the time, and was so enthused by the whole Body Gossip concept, I offered to make it part of the campaign. I also took over the PR for Body Gossip for a while, since I was working in that industry at the time. Now, Ruth and I co-run Body Gossip together. I remember my Mum telling me when I was about 17 that Ruth and I should work together when we were older, as we made a great team. As usual, my Mother was spot on! I can’t image a better partner – Ruth is a dynamic thinker, creative, resourceful and incredibly diplomatic. I am the ‘mouth’ of the campaign – My skills lay in communicating and educating – I’m not afraid to be controversial occasionally, either! We also work with an extended team of ridiculously skilled people, who look after our website, do the graphic design for the campaign, look after our social networking etc. We feel really lucky to have stumbled on so many talented individuals, who bring so much to our campaign. Do you think that a campaign such as this can really have an effect in a world that constantly promotes false beauty ideals? The issue which needs to be combatted is not the promotion of unnatural beauty ideals, which pretty much everyone is aware of and most people are opposed to, but this idea that people have that they’re powerless to combat it. As a society, we’re placing more and more emphasis on achieving an idealized beauty aesthetic. We’re told we need to look a certain way to be acceptable, to be successful, to be respected and even to be loved. Cosmetic surgery and scientific advances accelerate the process. We see looking ‘perfect’ as a quick fix for all the problems in our lives. But of course, we’ll never look ‘perfect’ because beauty paradigms are constantly shifting – Multi billion pound industries depend on us feeling insecure. The aim of Body Gossip is to make people realize the power they DO in fact, wield. We give one simple message: You ARE good enough. Just as you are. By asking the public for their opinion, we make them feel valued and important. We’re also hoping that by working with young people we are shaping the attitudes of tomorrow. I always tell my students: Look like the best version of you. By all means, wear makeup, dye your hair, experiment with fashion (I do! ), but do it because you want to look like an awesome version of yourself, not because you want to emulate someone else. What is your body gossip story? I’m half an inch shy of 6 foot and a size 16. I have a ridiculously hour-glass torso and disproportionately skinny limbs. I once described by body as being “like a cello on chopsticks”. I’m also an interesting and complicated racial mix – meaning I stuck out like a sore thumb amongst the slender, blonde haired masses where I grew up. People used to say I was ‘striking’ – It took me years to realize- That’s ok! For a long time I believed that I had the potential to be beautiful, but that my curves let me down. This belief led me to take all kinds of insane risks with my health and essentially robbed me of my late teens and early twenties, when I should have been enjoying and celebrating my youth! I wish someone had told me when I was in my late teens that there is nothing more attractive than being healthy and that there is more than one way to be gorgeous, which is part of the reason I teach Gossip School. I do occasional work as a plus size model, but I don’t subscribe to the opinion that plus-size is the ultimate way to be beautiful. Ruth is almost as tall as me and a size 8-10 and she rocks her own look and is attractive in a totally different way. There’s room for all shapes and sizes within the spectrum of beauty, as well as different ages and races. My Body Gossip story concludes with me realizing that there is no one better at being Natasha Devon than I am and being immensely grateful that, after everything I put my body through, it still works and allows me to do the things I want to do. Body Gossip on Tour is the brain-child of one of our team members, Charlotte Gatherer, and it allows universities to have their own, mini, internal Body Gossip writing competition, and to stage a Body Gossip event where some of these stories are performed. The initiative was first taken to Bath Spa University and has since gone to several others. 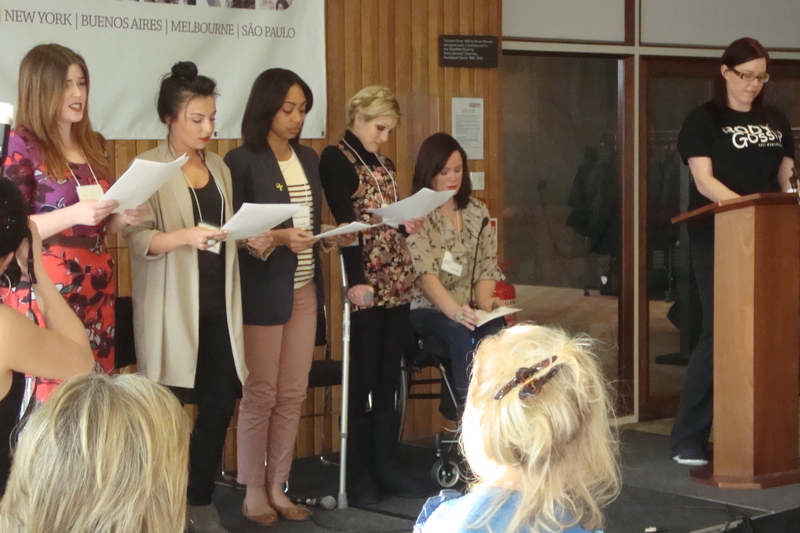 There is a performance taking place at York University this week (17 November). Which celebrity bodies do you think we should see more of and why? I believe we still need to see a much broader spectrum of bodies in the public eye – So a lot of the body types I’d like to see aren’t yet being represented. However, examples of a few people I applaud for being a little different from the accepted beauty paradigms would be: Helen Mirren, Christina Hendrix and Queen Latifa. What is next in the pipeline for Body Gossip? Ooooh, it’s such exciting times at Body Gossip! We have four brand spanking new films, to be released next Spring. They’re very different in flavor from our flagship film, ‘This One is For You’, which is an inspiring tale of eating disorder recovery. These new films are rant-filled, funny and poignant and they tackle issues like aging, celebrity culture and adolescence. They feature celebrities such as Natalie Cassidy, Louisa Lytton, Cerri Burnell, Nikki Grahame and Zaraah Abrahams. We’re also releasing our Body Gossip book next year – A book for the nation, by the nation. It’s a collection of real body stories from people of all backgrounds and ages from all over the country. The idea is that no matter who you are, or what you are experiencing, you’ll be able to pick up the book and find something that you relate to. It’s also features some celeb contributions from the likes of Jermain Defoe, Alesha Dixon and Tina O’Brien, as well as a forward by Mr Body Confidence himself, Gok Wan. Speaking of Gok, we’ll be featuring in his forthcoming documentary ‘The Naked Truth’, which at the moment looks set to be aired in February 2012. Twitter: @_bodygossip (official) @BodyGossipRuth (Ruth), @BodyGossipTash (Me). Also – Please note – Every month we have a ‘theme’ on our social networking sites, which we invite the public to give their opinions on. To see what we’re talking about each month, follow @BodyGossipSarah, who hosts the discussions. Reading this interview got me thinking about a) how dynamic and refreshing these women are and b) the stupid body gossip issues I have had for example not having a 6 pack, wanting bigger hips… I guess it is human to buy into images that are all over the place and embedded into your subconscious. Also image of self is relative and can depend on the day you are having. I admire what Body Gossip are doing as it is honest, it is not an idealistic view of reality, it is just real. I look forward to their workshop at our December event.